Over the weekend our family went to California Adventure (A Disney Resort Property). 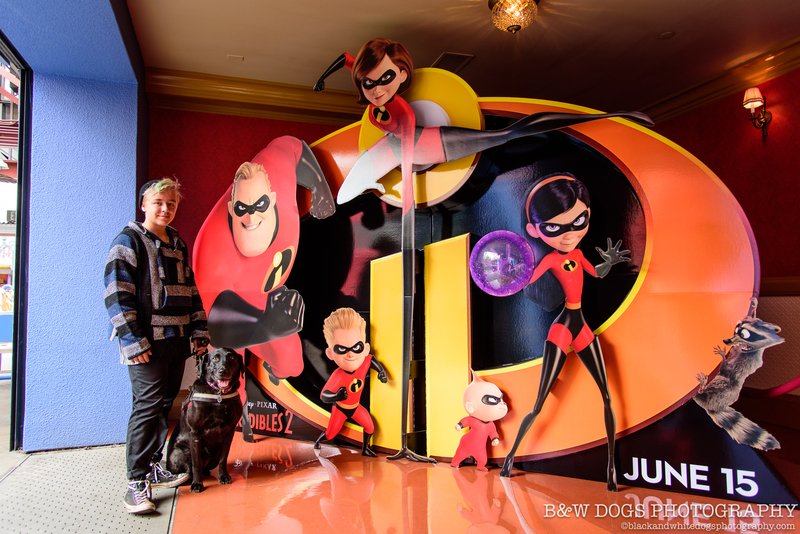 We take Raven with us when we go, as she really thrives in the kind of chaotic environment that is a crowded amusement park. 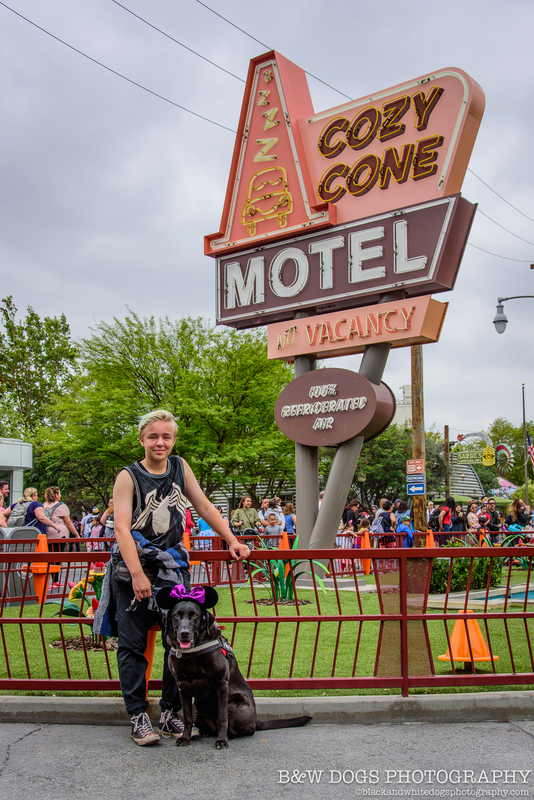 She loves going on rides, (yes, many of the attractions allow service dogs) has no problem meeting characters in costume, isn’t distracted by loud noises, booms from fireworks, flashing lights, or popcorn all over the ground. She works through all of it. One of the main reasons she is important to us at places like this is the “Disneyland effect” that happens to Quin’s blood sugar. We struggle keeping him in range at places like this. So many factors can affect blood sugar, and in a single trip to an amusement park we see all of them. The rides alone can cause excitement, fear, anxiety, an adrenaline rush, joy, all of which can swing blood sugars. Add in a lot of activity, amusement park food, and by the end of the day, exhaustion, and you can see it can be tough to manage. Quin normally can’t feel his highs or lows. We have had moments where we are having the best time, huge smiles, lots of laughs, and his blood sugar can be plummeting. 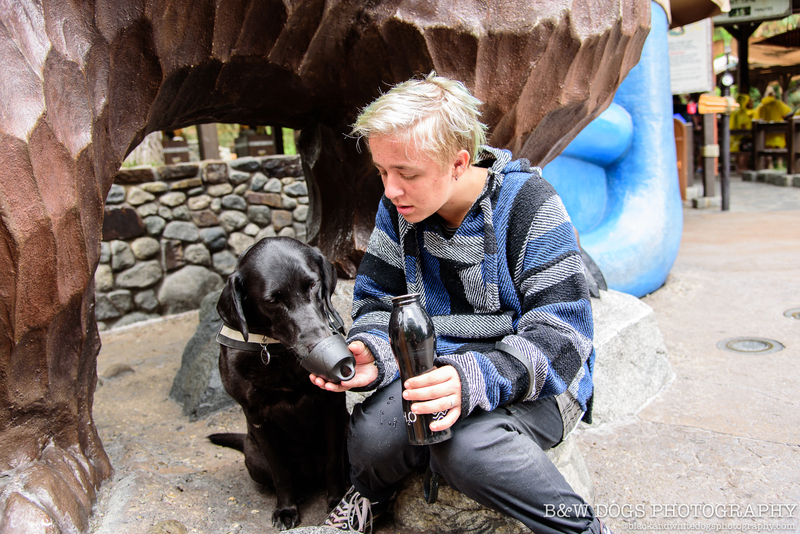 Yes, we have technology that aids us, but it is no where near as real time as our service dog’s nose. We have been using the services of a DAD (diabetic alert dog) for 7 years (both Major and Raven). 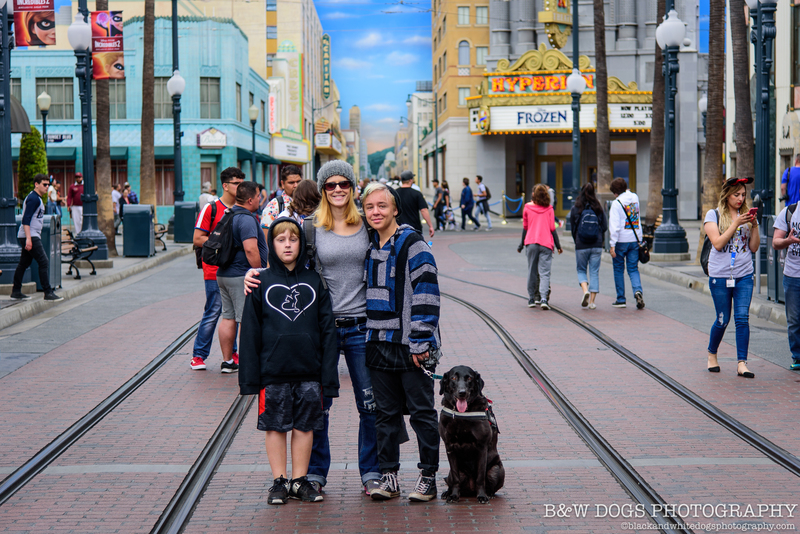 We have had many trips to amusement parks, on airplanes, in hospitals, schools, stores, restaurants, etc while accompanied by a service dog. We have never had an issue with our dog being unruly or anything other than an excellent example of what a well trained SD should be. We have never had an issue with a proprietor of any establishment, or had issues with police or TSA at anytime. Yes, we have been asked if our dog was a SD, we have been approached by security inside many places and questioned, and we have been asked more questions than are legally allowed. We have always conducted ourselves professionally and respectfully, and have demanded the same in return. In most cases, there was no further issue and we left with all involved smiling. In other cases, we have had to do some educating and advocating, and again, no further incident, lawsuit, banishment or the like came of it. Our attitudes in those situations, along with having dogs that have thousands of hours of training, public access, knowledgeable and experienced handlers, and of course, the most important part, well trained dogs, have aided us immensely. 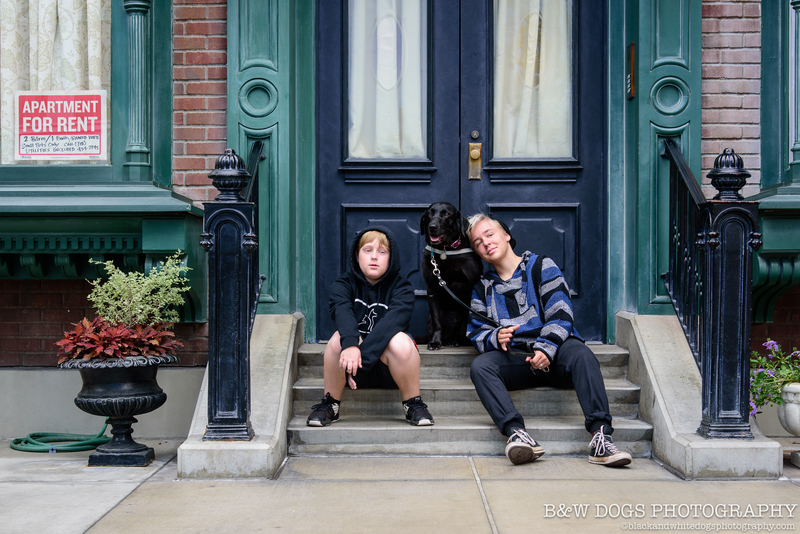 A willingness to always educate and advocate, knowledge of the ADA and service dog laws, and a need to protect both our family and our dogs has helped us smooth over any possible confrontation that may have presented itself. I am a utilizer of service dogs to protect my family. And yet I am frustrated by the proliferation of “fake” service dogs that we constantly run into almost every single day. I fear that the time will come when it will either become so difficult to use a service dog in public (either through regulations and laws) or because everywhere will be forced to be dog friendly (we already avoid places that allow all dogs due to issues with aggressive or in appropriate behavior, poor handlers, flexi leads, or handlers that completely ignore their dogs). I already see factions organizing around the future of SD’s. One side believes the ADA (Americans with Disabilities Act) already spells it out clearly, and another side that believes tests, licensing, or certification needs to be instituted. There are many others that don’t quite know what the answer is, but believe that current state isn’t working. Back to our day at California Adventure. We got many compliments from park staff on how well behaved Raven was. The staff at Disneyland is well versed in SD etiquette and ADA law. They never asked more than the 2 appropriate questions (is this a SD?, what service does it provide? 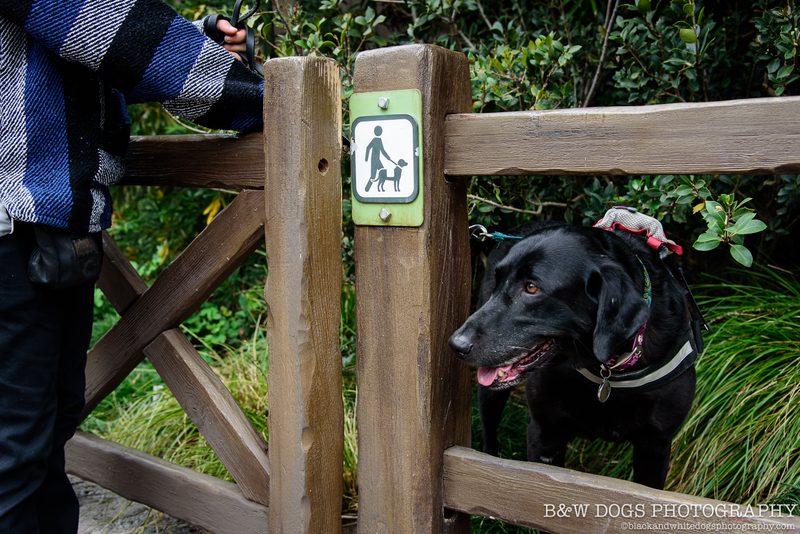 ), they never ask to pet or try to distract your dog, and the park has special, well marked maps indicating which rides are appropriate for SD’s, or that have kennels for your dog so you can ride and they can wait safely. The park also has designated “bathroom facilities” for SD’s throughout the property. I’m not sure if all of this positive, proactive approach from the park has had the unintended consequences of many thinking the park is dog friendly. 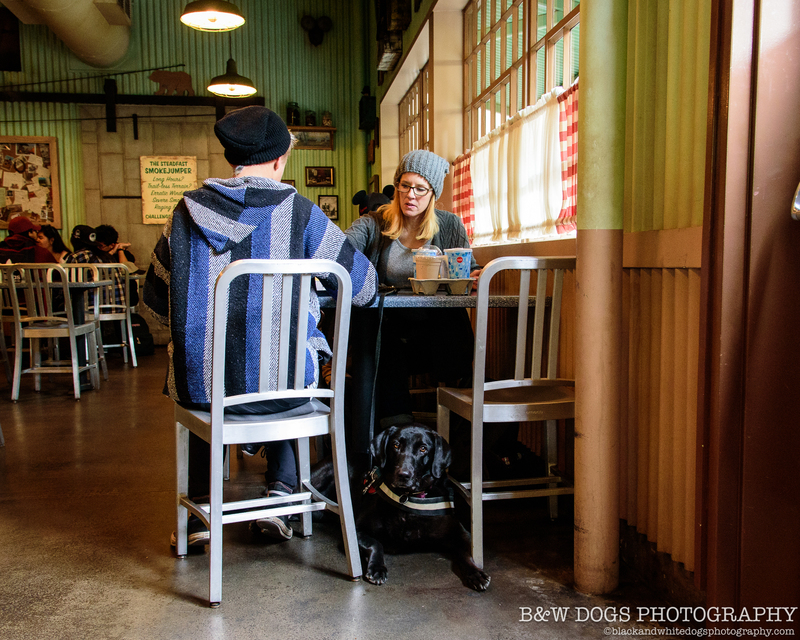 We don’t go there often and we aren’t pass holders, but on the few occasions we have been there, we have had run-ins with people and poorly behaved dogs. Small dogs in back packs snarling and barking at our dog, a group of family members huddling around their dog in a store so it wouldn’t see Raven and start to bark, dogs in carts and strollers that bark at all passerby, seeing dogs using the major walkways as restrooms (even saw a dog lift a leg on a display in a store) and handlers not stopping to clean it up or notify anyone, we’ve even seen dogs swipe food off of tables. 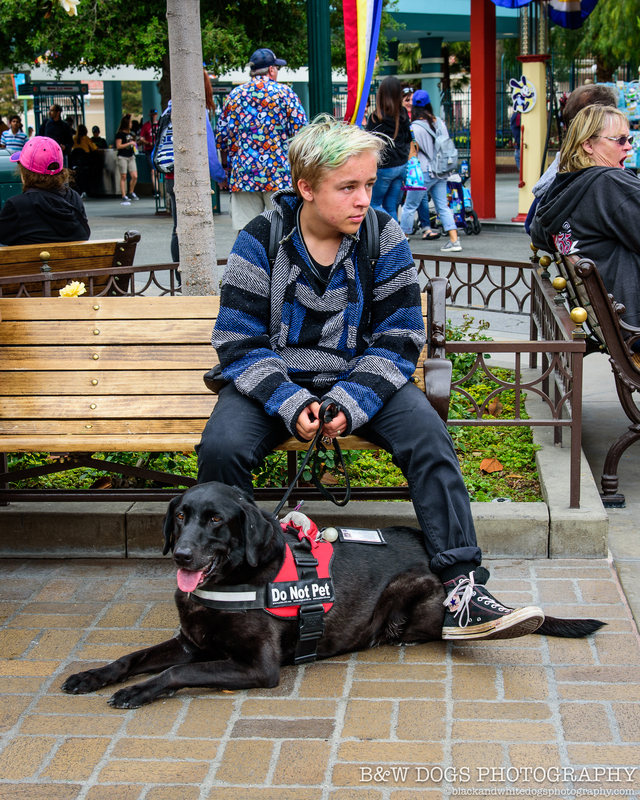 This leads people to assume that everyone is “faking” with a service dog in public settings. 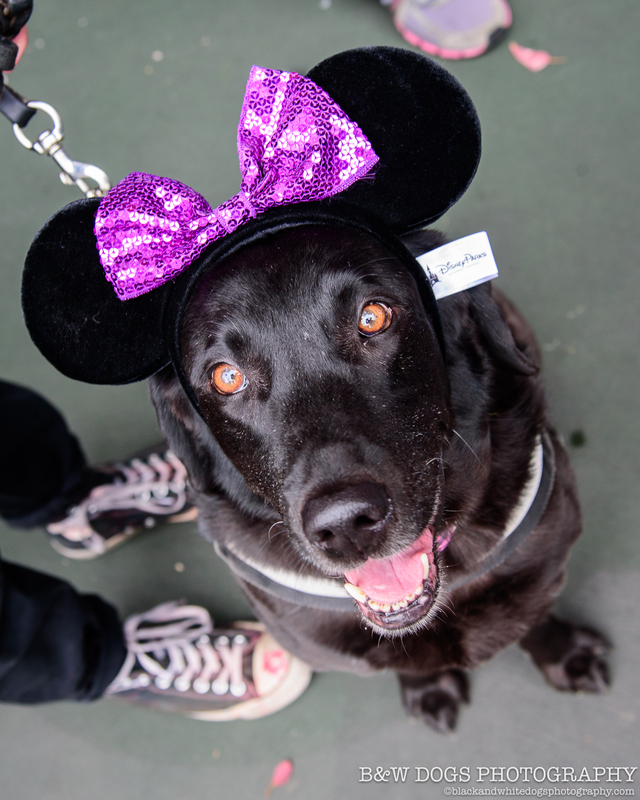 This feeling of having to prove our dogs validity is not just an issue at Disneyland. At this point it is everywhere. When we shop at Target, go to a restaurant, or just about anywhere else, we feel like we have to either prove ourselves, while everyone else waits for the inevitable to happen, a bark, a snarl, defecating on the floor, or something like that. There are conversations that happen behind us constantly. I’ve talked about that before here. There are also lots of people that approach us that want to know how they can bring their dog. They inform us that they got their dog a vest so they could take their dog on a plane with them, or into a restaurant. Oh the irony. Truth be told, I’d rather have a cure for my son’s disease and a pet dog at home. That is my dream, my wish, not how I wish I could take fluffy with me to Starbucks. One of the reasons fake service dogs are such an issue is that ignorant pet owners don’t realize just how stressed out their pet is when they force them into those situations. That’s why we see so much aggressive and inappropriate behavior. It is a danger to their “beloved” pet and to the general public. And it is outright threatening the service dog community’s ability to use dogs safely. 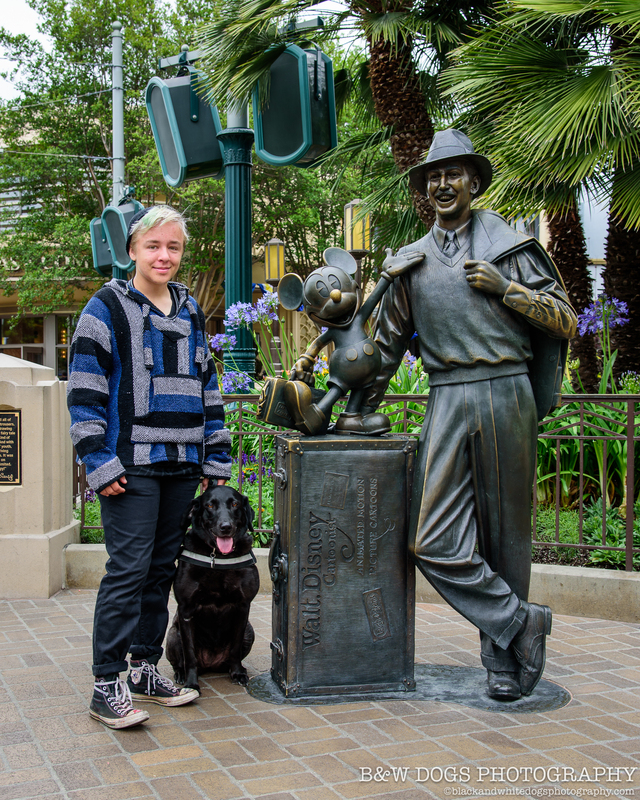 To the amazing cast at Disneyland resorts, thank you for providing us with a wonderful, memory filled day, and for creating an environment that our family and our service dog can enjoy. To the people that continue to pass off their pets as Service Dogs, just stop it.You are truly hurting those that need it most. The continuing use of fake service dogs has led to countless state laws and/or reviews, issues with airlines, and threatens public safety. There is no need for a vest, there is no certification requirement, and people have taken advantage of that. Enough is enough. Stop faking it, it isn’t fun for your dog, it isn’t fair to us, and frankly, it is dangerous and someone will get hurt. I am proud of our team. I am proud of all the work, effort, and time Quin has put in to become an excellent dog handler and trainer for our dogs. And I am always proud and in awe of how amazing our dogs are. So I do enjoy the compliments, and they are well deserved. I just wish that every dog we encountered while doing public access were as well trained. Thank you for the great story. I am sorry your child suffers from diabetes since I grew up with a father who is diabetic. 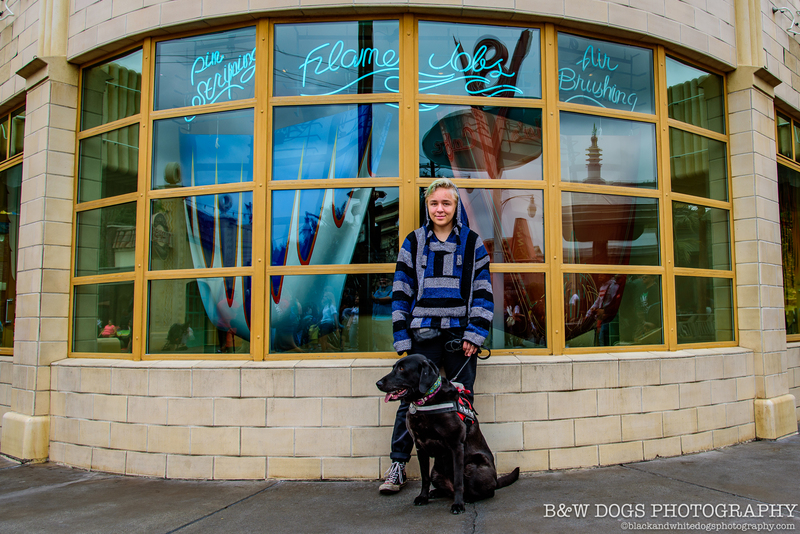 Glad you have a service dog that is equipped to help you understand when levels are not right. The place i work encounters “service dogs” all the time. I wish the same that people would stop faking their dog as a service dog when it’s not. I do wish there was an easy way to be able to verify if a dog was or wasn’t a service dog, just so i don’t have to be the one to ask the questions. I’m at the point unfortunately that i feel that no matter what if i ask about the dog or inform them that dogs aren’t allowed, the person will automatically say it’s a service dog where it is or not. I also feel that if a service dog doesn’t have a vest on. I am a DLR CM. While I do not claim to represent the company, I can say Disney Cast Members take pride in helping those who truly need it. I am beyond happy you had that experience. From the sound of your “voice” in your piece, it sounds like it was a pleasure to assist you and your family.